This is the ULTIMATE Easy Banana Pudding Recipe, made with butter cookies and fresh whipped cream. 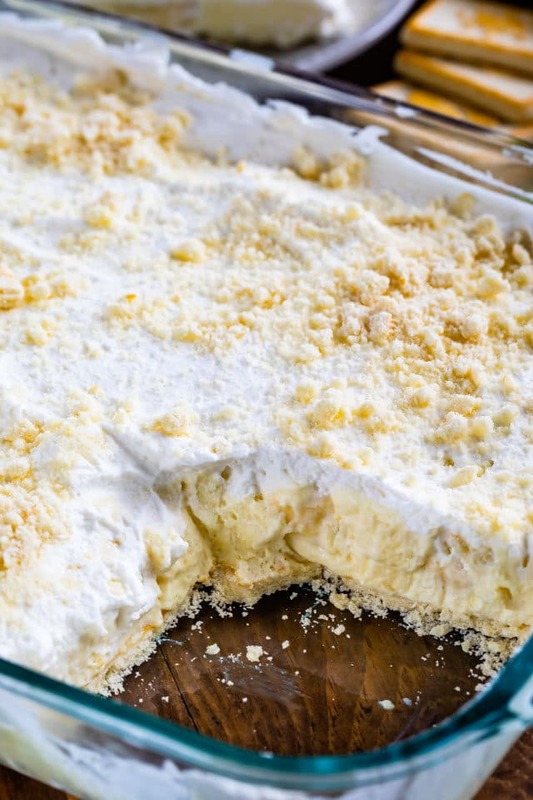 This no bake dessert is the perfect potluck recipe. I think I’ve told this story before (when I posted banana cream pie) but it’s worth retelling because it’s one of my absolute favorite Mel stories. The first time I brought Mel home (back in 1999!!) my parents made him dinner. I’d told them all about him and the things he loved and one of them was bananas. He ate bananas every day and I’d mentioned that to my mom, so she made banana cream pie for dessert. One thing I’d neglected to tell my mom: Mel hates pudding. HATES IT, like, can’t even swallow it. Mel is nothing if not polite (once, at a friends passover dinner he actually ate the Gefilte fish they served), he took it like a man and ate the entire slice. Then, when she saw how much he liked it she served him another piece and he ate that one too. I am not as nice as him, lol. I’ve said that our entire marriage: he’s the nice one, I’m the b-one. But, the one thing his dislike of banana pudding gets me? MORE BANANA PUDDING. 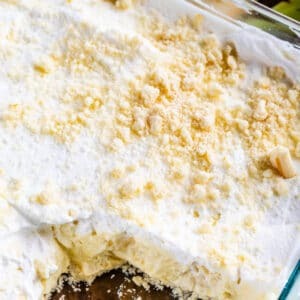 I’ve made several versions of banana pudding (fluff salad, cake, lush) but this recipe is a more traditional banana pudding recipe. 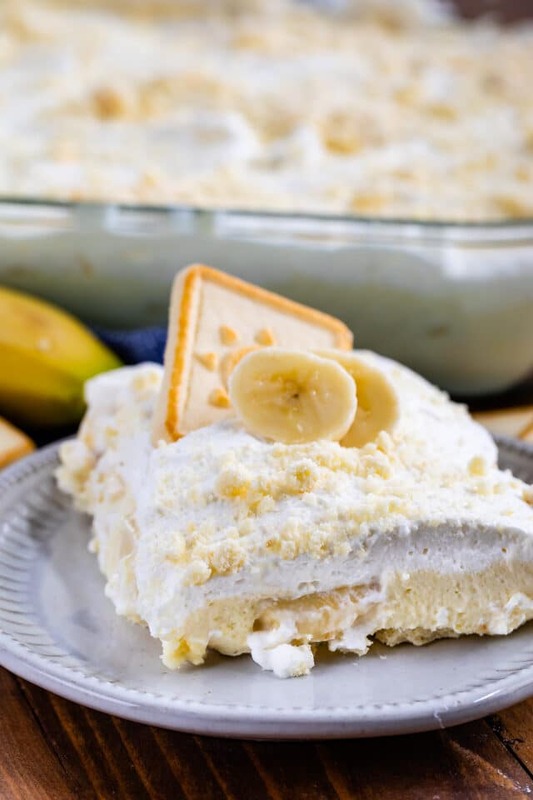 This Easy Banana Pudding recipe has a layer of butter cookies topped with easy vanilla pudding with condensed milk, lots of fresh bananas and whipped cream! It’s like heaven in a pan, really. 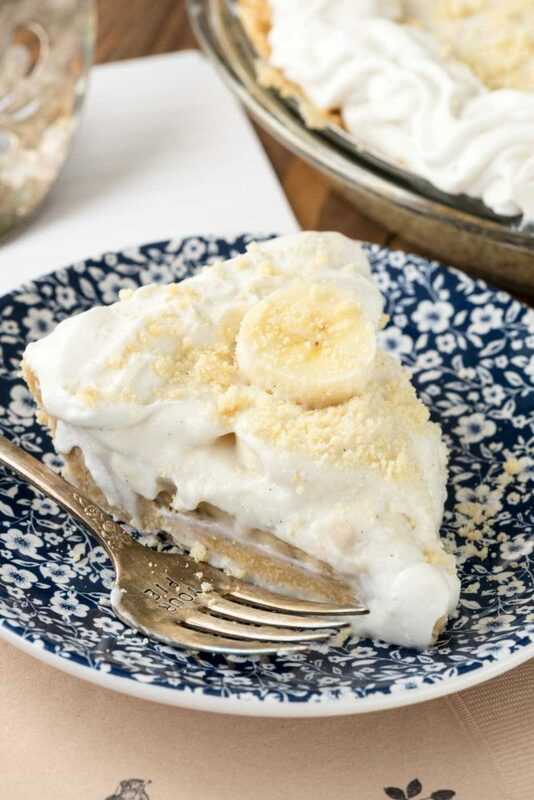 This banana cream pie recipe is so easy and oh-so-good; I had to re-home it as soon as I photographed it! What kind of cookies do you use for banana pudding? The traditional cookie for banana pudding is a Nilla Wafer, or at least that’s what the internet has you believe. I’m not a huge fan of vanilla wafers, so I went with butter cookies. I used Pepperidge Farm Chessman Cookies because they are light and delicious at the same time, but you can also use shortbread cookies (i.e. Walkers or Lorna Doone). 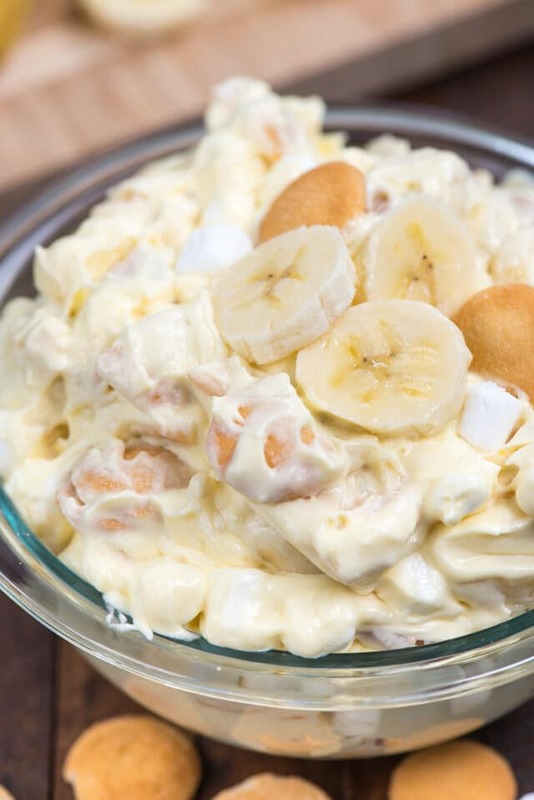 How do you make a quick banana pudding? Well, something that was always weird to me is that banana pudding actually has vanilla pudding as its base. I guess the “banana” comes from the sliced bananas in the pudding? I started this banana pudding with an instant vanilla pudding recipe. If you want to make pudding from scratch, you can use this recipe. I didn’t use cream cheese, but I did make my banana pudding with sweetened condensed milk. It adds an extra layer of sweetness to the dish. I also added a bit of banana extract to the pudding to amp up the banana flavor of the recipe. Be sure to use just ripe bananas for this recipe; bananas with no spots. The banana will get brown and age in the pudding so it’s best if you use one that’s not too ripe or they’ll get mushy. Can you make banana pudding with cool whip? You definitely can! I used fresh whipped cream for this recipe because I love the taste of that more, but you can substitute cool whip for an even easier recipe. How long does banana pudding last? I mean, if you’re anything like me, about a day? Ha, but – I’d make this only a day ahead max, and eat it within 48 hours so the bananas don’t get funky. That makes this the perfect potluck dessert! Use any kind of cookie you like, but I love the Chessman butter cookies. Instant vanilla pudding makes this come together quick with sweetened condensed milk. Feel free to swap cool whip for the whipped cream. Use just ripe bananas for best results. 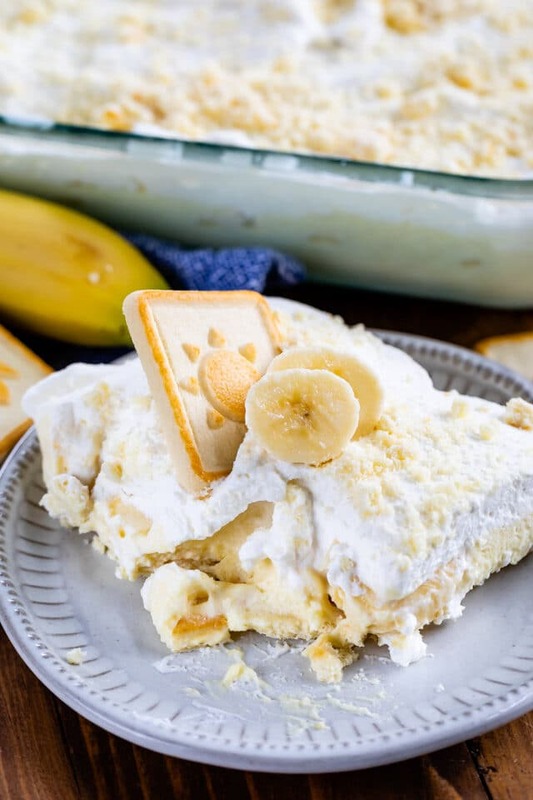 An Easy Banana Pudding Recipe is the perfect potluck or summer dessert made with butter cookies, pudding mix, fresh bananas and whipped cream. Whisk pudding mix, milk, sweetened condensed milk, and both extracts in a large bowl until smooth. Set aside to set for 5 minutes. Make whipping cream by beating heavy whipping cream with powdered sugar with a hand or stand mixer until stiff peaks form. Place one layer of cookies in the bottom of a 9x13-inch baking dish (about 24 cookies, depending on what kind you’re using), breaking some to fit if needed. Fold half the whipped cream into the pudding mixture. Pour half on top of the cookies. Cover with banana slices, then the rest of the pudding mixture. Spread the remaining whipped cream on top of the pudding and top with crumbled cookies. Cover and chill at least one hour before serving. Best eaten within 24 hours or up to 2 days (the bananas may discolor after a day or so). 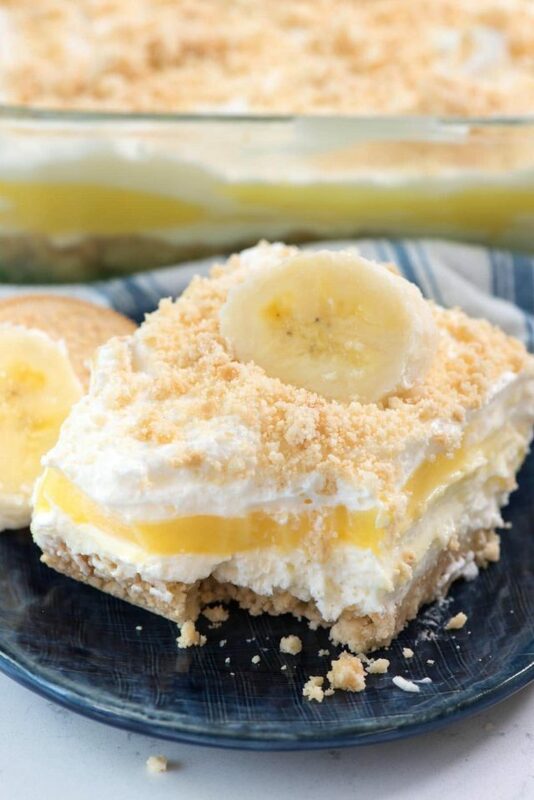 Banana Pudding Pie has a shortbread crust. Why don’t you use the banana flavor of instant pudding? It already has the banana flavoring in it.